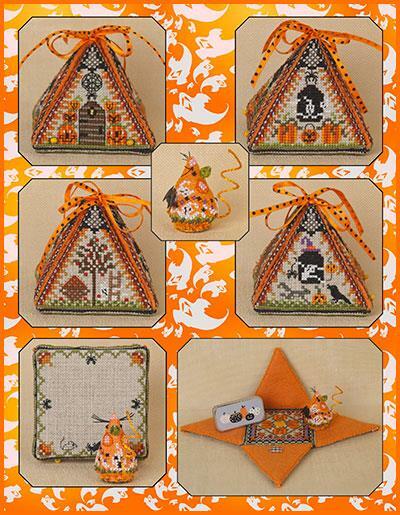 Materials included: Color Cover, 12-page Stitch Guide, 24” of Ribbon, Orange Felt, Chipboard Base, Hex Beads, 2 Pumpkin Beads, Wired String Tail, Signature Button Mouse Base, Green Glass Hat, Black Satin Bat, and a little Gingham Heart to decorate a wall. Not included: fusible craft weight interfacing and straight pins for the hat and bat. Introducing the third design in our NEW Mouse in a House Limited Edition Series. There will be 4 seasonal designs in 2017. All houses will be the same shape and size and each house will have its own mouse included. NOTE: Materials and templates are designed for the specified 32 count linens. 222H X 164W Cut Size: 14" X 10¼"
(35.6cm x 26.1cm). This includes 2" margins all around and 1" between motifs. 27H X 51W Cut Size: 7" x 7"
House is built from 4 lined triangles attached to a square base. Pretty ribbons tie the sides together. Mouse fits inside! Finishing instructions included. Miss Ghostly Pumpkin Mouse not available separately.